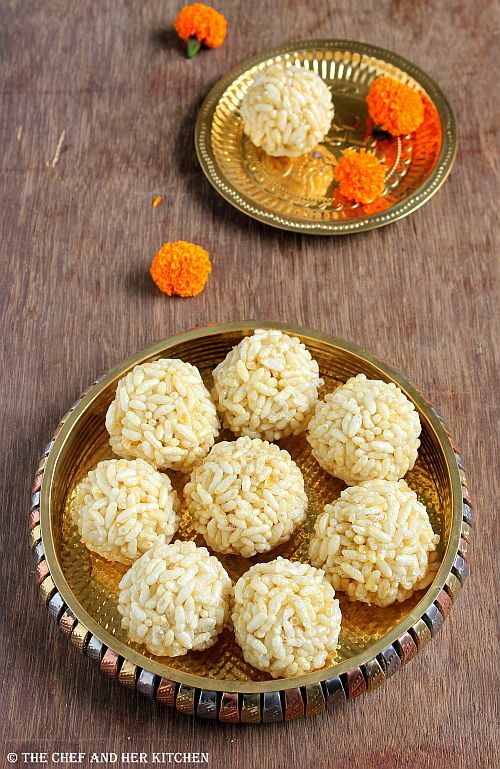 Marmarala Ladoo is one among those few sweets I used to enjoy as a kid and we used to call it as 'Borugula Undalu'. 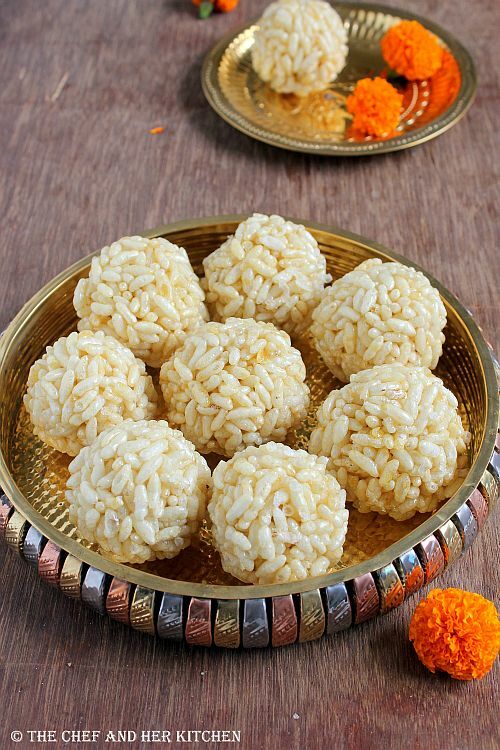 I used to like mildly sweetened sweets like Rasgollas, Puffed rice ladoo etc. I used to even squeeze out most of the syrup from the rasagollas and used to prefer to eat it that way.But now I am not the same person any more what ever I used to hate before I would not mind eating them, might be our preferences change according to the times. 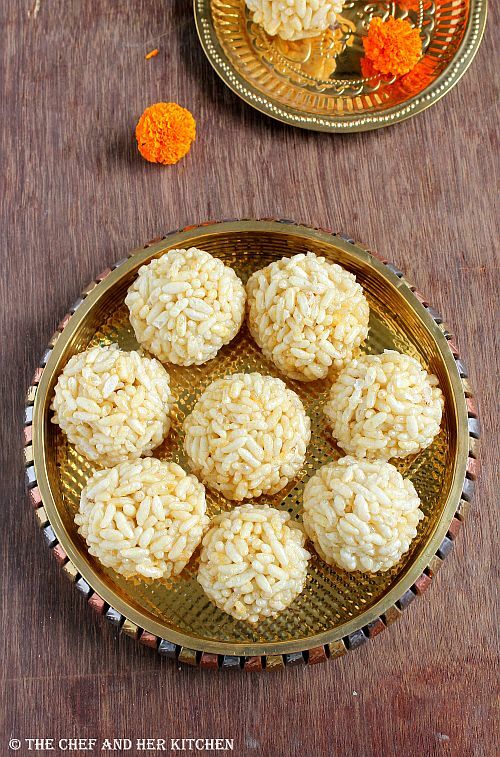 Coming back to today's recipe Puffed rice ladoo is prepared by mixing the puffed rice in jaggery syrup and rolled into big ladoos out of it. Puffed rice is known as maramaralu or borugulu in Telugu and pori in Tamil. It is usually prepared for Karthika(Karthigai) deepam but I do not mind preparing it any time of the year as it is one of the easiest and low fat sweets which tastes great. It is usually a kid's favorite, do give them a try for your kids if you have not prepared them before and I am sure that they will love it. 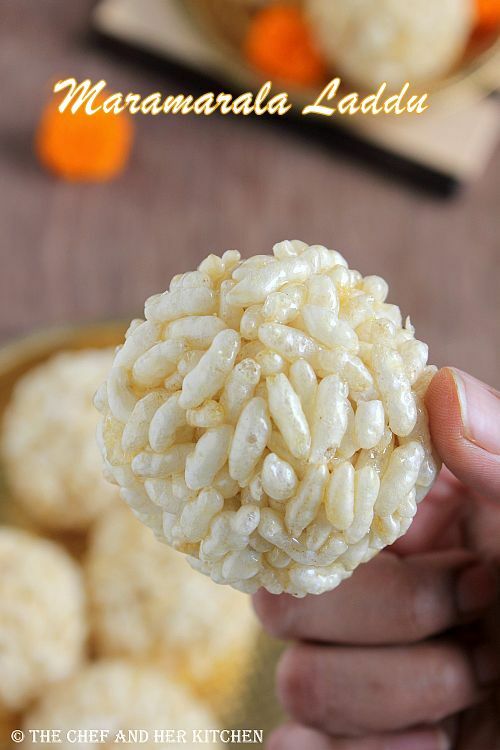 You can try this fat free low calorie Puffed Rice Ladoo for Diwali too it simple, easy and healthy. Clean puffed rice to remove mud or stones in that if any. Pour just enough water to cover the jaggery and heat it in a kadai till it melts completely. Strain though a fine sieve to remove dirt. Rinse the kadai and pour back the jaggery solution and add cardamom powder and boil briskly until it reaches SOFT BALL consistency.You should keep a bowl of water handy to check the consistency, drop a small amount of syrup in cold water, if rolled with the fingers the syrup should form a small bowl and it should be soft in texture. It is very important to get this consistency otherwise you cannot make balls(ladoos) out of it. If you cross this stage your ladoos will become hard and if you switch it off before you would not be able to make ladoos with it.So it is important to achieve soft ball consistency as mentioned. Once this consistency is reached you can reduce the flame and add the puffed rice and mix it quickly until the syrup holds the puffed rice. 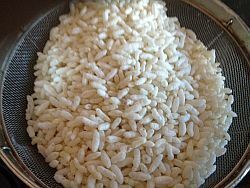 If you feel that the mixture can hold more puffed rice,please feel free to add another 1/4 cup -1 /2 cup of puffed rice. Switch off the flame and leave it aside for 2-3 mins until you can handle to make ladoos with that mixture. Grease your hands with ghee and take a big portion of mixture and make it into a large ladoo of an medium orange sized one.Usually you can not prepare the shape exactly in the first go. So I usually make the balls out of it in a rough shape and once everything is done I again press them tightly to get a perfect round shaped ladoo. The syrup might get hardened in the later stages which makes it difficult to make ladoos, you can put the kadai back on fire and warm it a bit and proceed with making ladoos again. Let them cool and they will harden a bit and hold its shape. The key point to prepare this ladoo is in the process of the syrup. It is very important to achieve SOFT BALL consistency in the recipe, so follow the process bit carefully to avoid nay mishaps. You can add 2-3 tbsp of fried gram(roasted gram/chutney dal) and also 2-3 tbsp of finely chopped dry coconut pieces along with puffed rice in the recipe. I usually do not add as I like them plain with puffed rice. You keep another 1/2-1 cup of puffed rice handy just in case if you need to add more while preparing it. I use chikki variety of jaggery to prepare this as it makes the syrup nicely and also tastes nice. You can use any good quality jaggery for the same. Love ur clicks and thanks for sharing.I never tried. Very well explained and prepared. Beautiful clicks. 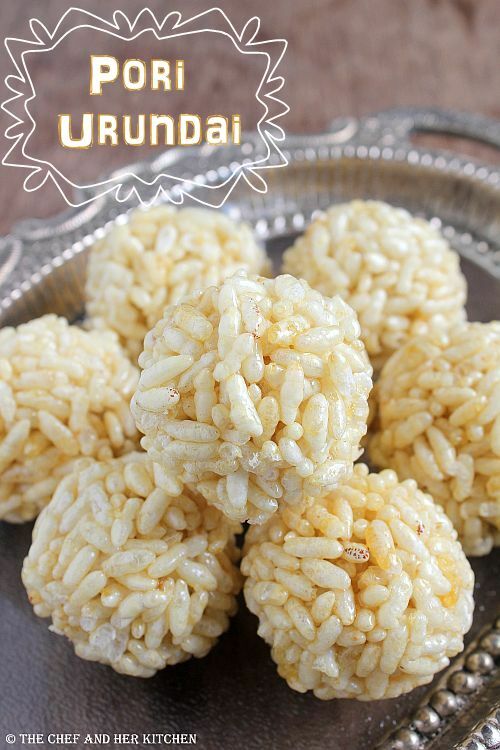 Can we follow the same technique to make puffed rajgira seeds chikki/ladoo? It looks very good. Thank you.